Chiliwhist Jim was a prominent medicine man and spiritual leader from the Malott Area. The Methow originally lived in and around the Methow River Valley. Long Jim’s father was Innomeseecha, who was also a leader of the Chelan. The homeland of the Chelan centered around the shoreline of Lake Chelan and down the Chelan River to the Columbia River. John Harmelt refused to sell the Wenatchi rights to a reservation and remained in the Wenatchee area until his death. The Wenatchi people originally lived west of the Columbia River, in the Wenatchee River Valley. Silicosasket refused to relocate to the Colville Reservation and took an allotment at the mouth of the Entiat River. The Entiat lived in the Entiat River Valley. The Entiat probably had a small- er population than neighboring tribes. Chief Moses served his people as a warrior during his younger years, but later tried to protect his people through diplomacy as the leader of the Moses-Columbia. The traditional territory of the Moses-Columbia consisted of approximately 4.3 million acres. This area is roughly bordered on the north and west by the Columbia River. It extends south the Pot- holes area and east towards the Ritzville area. Tonasket was an Okanogan Chief born around 1819. He maintained a ranch by the Kettle River that included a small general store and a horse track. The Okanogan traditional territory is comprised of the drainage system of the Okanogan and Chewuch rivers, as well as the Sinlahekin Valley. Chief James Bernard took many delegation trips to Washington D.C. on behalf of the Colville Confederated Tribes. The Lakes territory centered around the upper Columbia River, possibly reaching as far north as the “Big Bend” of the Columbia, north of Revelstoke, British Columbia. The southern limit of the Lakes’ land is found near Northport, though many also fished at Kettle Falls. Kinkanaqua was the last Salmon Chief of Kettle Falls. Some sources report that he had closer ties to the Lakes than the Colville. The Colville lived in the area between the Kettle and Columbia Rivers south to the mouth of the Spokane River. Jim James was one of the last individuals to be regarded as a traditional chief. 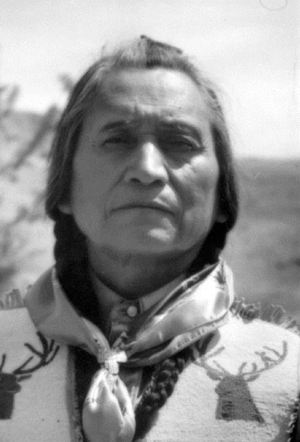 He presided at the “Ceremony of Tears” prior to the inundation of Kettle Falls in 1939 and served his people faithfully until his death in 1961. The Sanpoil territory centers around the Sanpoil River Valley, extending north to the boundary of the current Colville Reservation. Nespelem George served his people as a peacemaker and mediator. The Nespelem Territory starts north at the headwaters of the Nespelem River and heading south of the Columbia River. Chief Joseph led his band of Nez Perce who refused to leave the Wallowa Valley until a war erupted between his people and the U.S. Ar- my. After years of exile in Oklahoma, Joseph accepted Chief Moses’ offer to move to the Colville Reservation. He was never allowed to move back to his homeland. The majority of Nez Perce villages concentrated on the banks of the middle Snake and Clearwater Rivers, as well as the northern portion of the Salmon River. Cleveland Kamiakin was a young man when the construction began on the Grand Coulee Dam. As a leader of his people, he spoke out against the broken promises of reduced electricity rates and job opportunities for Tribal members, which the U.S. Government had made to previous tribal leaders prior to the construction of the dam. The Palus territory extended from the confluence of the Snake and Columbia Rivers in the west.